Kalahari Arms Hotel is a clean and friendly hotel in small town Ghanzi, half way between Namibia and Okavango Delta in Botswana. Located at T-junction of Vize and Jankie Streets in Ghanzi. Situated within Ghanzi on the Trans-Kalahari Route to Maun. We have accommodation for all types of budgets, so if you just looking for bed and breakfast or looking to camp out under the African sky then this is the place for you. We have a terrace where you can lounge out in the sun, or if you prefer to lounge in the shade, we have a lapa where you could enjoy icy cold ones whilst soaking up the beautiful garden. Kalahari Arms boasts having a half size Olympic swimming pool and an enjoyable playground for the kids that has slides, swings and much more for the kids to enjoy whilst you laze on the luscious green lawn soaking up our wonderful African sun. 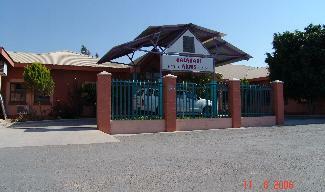 Welcome to Kalahari Arms Hotel in Ghanzi, Botswana! All rooms/chalets at Kalahari Arms Hotel: En-suite bathroom, DSTV, air-condition , coffee/tea-making facilities.